Three (of 5) skeins of Rowan Summer tweed (silk and cotton) and 2 skeins of Koigu in a very similar shade. 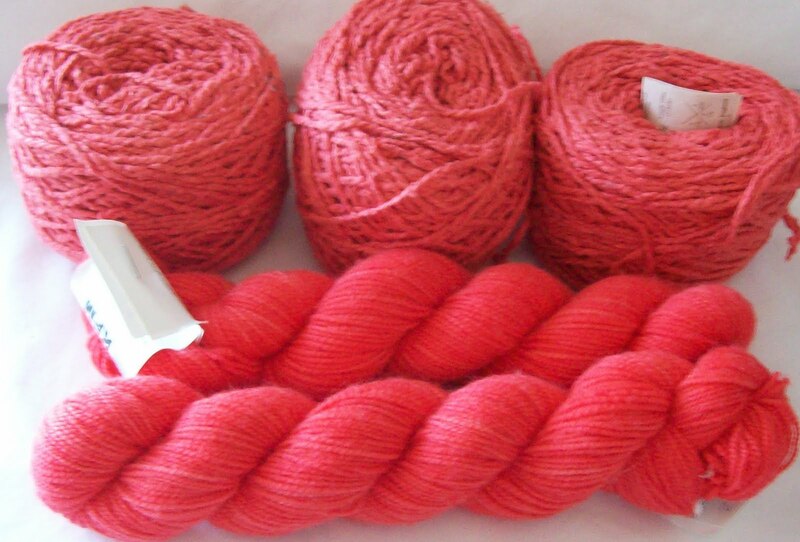 The 5 skeins of Rowan will morph into a cropped summer sweater (with short sleeves). The Koigu will become (most likely not till next year!) a pair of socks. How can I even think about more socks!? Some more camera shy socks got photographed; 43 pairs in the photo album, 3 pairs (in laundry) to photograph, 1 and half pair hiding. Another pair on needles, and 2 more pairs set up to go--one the frogged hand painted yarn, destined to become SKEW, and one set of Kroy Stripes—Mullberry color way, destine up to become another Cross Purposes (improved pattern, also being documented, for anyone who might be interested) ribbed socks. So tally that up, 43 so far in album, 3 more in wash (46) and 1 (maybe 2) pairs in hiding, 1 pair on needles (and nearing completion) . 4 dozen pairs of socks! There are two other pairs of socks—a pair of bed socks knit in DK weight yarn, and a pair of stirrup socks (no toes, no heels; a simple to knit ribbed tube!) that are also on the agenda for fund raising/charity projects. Both of those socks will be fast knits—and don't count! I might even make a third pair of socks; short cuffs, and no toes; pedicure style. Since socks like these are worn with flip flops, I could use a thicker yarn (Sports weight) and knit them up on size 3's. Worn with flip flops, it wouldn't matter if they were a bit bulky. They too, would be for fund raising. Meanwhile, Cotton Candy socks continue to stack up. Heels (gusset) are done—and now things slow down a bit. The stitch pattern is a rib—but one that changes—shape and count. R2 is working the 2 K's together, K, YO, K,YO, K (5 stitches) into the K2tog, P2 (that is 16 repeats of a 7 stitch pattern—or 112 stitches! Almost double the number of stitches. R4, R6, R8 are decrease R's—until I am, once again, at 64. The cake of yarn are rapidly becoming smaller and smaller, and are hollowed out shells of their former selves. I am 1 full pattern repeat past the heel shaping, and each repeat is .75 of an inch. I think I have enough yarn for another 2 full repeats, and then a short ribbed cuff. So these socks will be short ones—just 3 inches of leg/cuff, not the more usual 6 (or more) inches. But since the yarn was free (to me) that's fine! Besides, my goal was to have them finished today—so no real complaints that I am almost out of yarn. Sockapalooza! Who says there needs to be a limit? I would be tempted to combine the Rowan Summer tweed and the Koigu.